A University of Nottingham historian has helped resolve a global debate about scientific evidence for ancient extreme climate events by examining medieval manuscripts and other historical sources. In a paper published in the world-leading scientific journal, Nature, Dr Conor Kostick’s research into medieval evidence for climate events has allowed scientists to pinpoint the exact relationship between historical volcanic activity and severe winters. Climate science has made major steps forward in recent years as data collection from natural sources such as tree-rings, ice cores and mineral cave formations has become more and more sophisticated. Much can be learned about the Earth’s changing climate from analysing the chemicals found in ice cores, for example, and a crucial phenomenon affecting climate is volcanic eruption. Scientists know that a major volcanic eruption can have significant cooling effects because its smoke plume injects sulphur particles into the atmosphere which reflects sunlight away from the planet. But what is the past history of such volcanic climate forcing? Most climate scientists believe it played a part in creating some of the cold years faced by our predecessors, such as 536 CE when a cloud covered Europe for a year, with disastrous consequences. But the exact relationship between historical volcanic activity and severe winters has been confused by the fact that for various reasons, dating errors can accumulate as scientists attempt to count the layers of ice in their cores. Now though, a team of ice-core experts has dug a new Arctic core and used new techniques to establish with great precision the dating of each ice layer. The results of their work shows that our previous ice-core dates for the period before about 1000 CE (and therefore for volcanic activity) are wrong by about seven years. 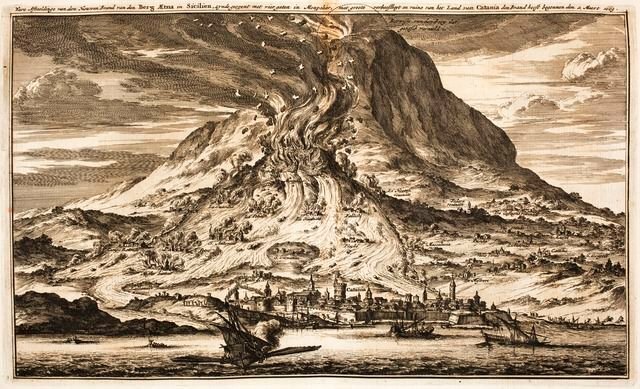 With the new data it becomes evident that for certain years, such as 79, 536, 626 and 939 CE, volcanoes did indeed cause severe cold to develop over Europe. Dr Conor Kostick commmented, “When Michael Sigl from the Desert Research Institute in Reno, Nevada and his team learned of my work on extreme medieval climate events, they asked could I find ‘tie-points’ – years in which the historical sources suggest volcanic activity. Thanks to my Nottingham Advanced Research Fellowship and my subsequent Marie Curie Fellowship I have been able to assemble a great deal of relevant evidence for unusual climate events in the medieval period. The resulting revision of the global history of volcanic aerosol forcing will be very important to researchers working in the climate sciences, historians and archaeologists. The major compilation of historical data published with the paper will also be a valuable asset in its own right. Dr Conor Kostick has been awarded a British Academy Rising Star Engagement Award for early career researchers. Click here to visit his webpage at the University of Nottingham website. Click here to access the article ‘Timing and climate forcing of volcanic eruptions for the past 2,500 years’ from Nature.